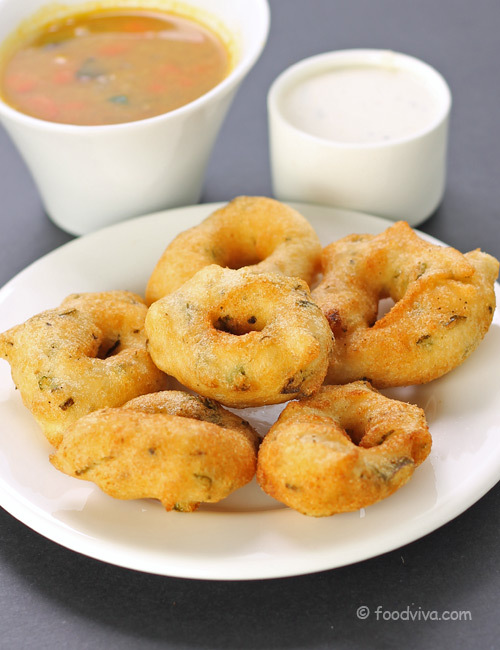 Medu vada (ulundu vadai) is a traditional dish from South Indian cuisine served with coconut chutney and Vegetable Sambar as a popular breakfast in most of the Indian restaurants. This crispy deep fried snack is made from urad dal (black gram lentils) and a few basic spices like cumin seeds, black peppercorns, curry leaves and green chillies. The process of making hotel style vadas at home is not difficult once you know the trick to get the perfect consistency of batter. 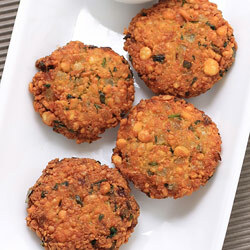 Before making vadas, don’t forget to read the recipe with detailed tips section to make them perfect. 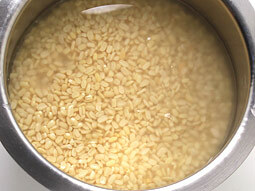 Take 1 cup urad dal in a small deep pot. Wash it 2-3 times in water and then soak it in approx. 1½ cups water for 2-3 hours. Don’t soak it for more than 3 hours. 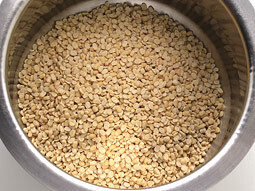 If possible, use whole skinned urad dal instead of split urad dal. 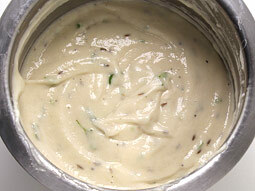 Drain excess water from the dal and transfer it to the jar of a blender/mixer grinder. Grind until the batter is fluffy and have smooth texture. Sprinkle few drops of cold water while grinding to grind it smoothly. 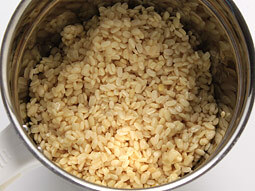 Don’t add too much water while grinding (added less than 1/2 cup water). While grinding, scrap the sides with a spatula and sprinkle water as needed to grind it smoothly. Batter should be thick in consistency. 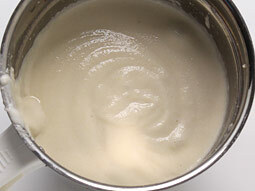 Transfer batter into a bowl and beat it using your hand for 1-2 minutes in one direction. 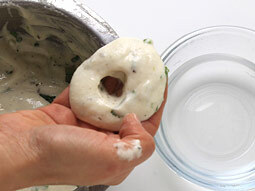 This process incorporates air which makes the vada light and fluffy. To check the batter is fluffy enough or not, drop a small portion of batter in the bowl filled with water and if it floats on the surface it means that batter is fluffy enough. Add 1 finely chopped onion (optional), 1 teaspoon cumin seeds, 1/2 teaspoon crushed black peppercorns, 5-7 chopped curry leaves, 1-2 chopped green chillies, a pinch of asafetida (hing), 2-3 tablespoons chopped coriander leaves and salt. Heat oil in a deep kadai or frying pan over medium flame. Wet your palm with water. Take medium lemon sized portion of batter on your palm, press it gently and make thick round shaped vada. Make a whole in the center using your thumb. When the oil is medium hot, slowly slide vada in it; add 3-4 vadas at a time. Flip and deep-fry both the sides until they turn light golden brown and crisp. Drain excess oil and transfer them over kitchen paper on a plate. Repeat the same process for remaining batter. 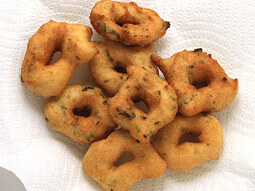 Spongy medu vada is ready to serve with hot sambar. Don’t add too much water while grinding the dal else the batter will turn watery and it will be difficult to shape vadas. Don’t grind the batter for too long at once as it will make the batter like a paste and it may be difficult to shape vadas. Grind it for few seconds; stop for few seconds and then grind it again for few seconds. Follow this method to grind the batter. If the vada absorbs too much oil it means you have added more water while grinding. When you make the batter next time, don’t add too much water. If batter is too watery, add few tablespoons of rice flour. It will make the batter thick and vada will also turn crispy. If you find it difficult to shape vadas on your palm, you can use a plastic sheet or a banana leaf to shape the vadas. Grease the surface of plastic sheet with oil and place a portion of batter on it, give a round shape and make a whole in the center of vada. Take the vada gently from plastic sheet into the palm, add it to the hot oil and deep fry it. 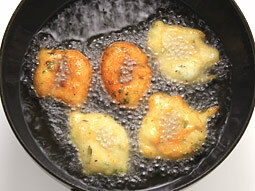 Make sure the temperature of oil is medium hot while making the vadas to cook them evenly. If oil is very hot, vada will turn golden brown immediately but remain uncooked from inside. If the oil is not hot enough, vada will absorb more oil. Serving Ideas: Serve it with coconut chutney and hot tea as morning breakfast/snack. You can also serve it with idli, hot sambar and nariyal chutney as a breakfast. I always follow recipes from foodviva & till now my dishes which I prepared by following these recipes were good & tasty. Good Recipe. It is easy to follow step by step.